[uvw] -- The direction of the incident electron beam. hkl -- The coordinates of an allowed reflection in the Nth order Laue zone. Figure 3902a shows ZOLZ (zero-order Laue zone), FOLZ and SOLZ (second order Laue zones). Figure 3902a. Schematic of ZOLZ, FOLZ, and SOLZ. However, the structure factors can cause all the reflections in a FOLZ to be forbidden so that the first ring of spots in the experimental diffraction pattern is from the second layer of the reciprocal lattice but we still call the SOLZ as the FOLZ. Note that to experimentally observe FOLZ reflections, the TEM specimen should normally be carefully tilted along mirrors until FOLZ areas appear on the pattern and long exposure time is normally needed since such reflections are often far away from the center of the screen and are weak. The analysis of Laue zones can provide detailed information regarding the samples. 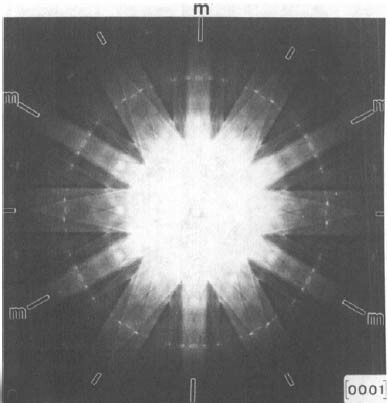 For instance, √2-TTB phase of PbxNb1.17W1.0O5.93+x (x > 0.15) in Figure 3902b presented asymmetric electron diffraction patterns and exhibited systematically weak odd-order (First order here) Laue layers lying half-way between the positions of the strong even-order (zero and second order here) layers. The even-order layers correspond to the basic 3.8 Å cTTB (c axis of TTB structure) repeat. Analyses of multiple samples indicate that these weak odd-order reflections were present in the same positions as the maxima in the even layers and at the midpoint of each edge of the basic TTB square. 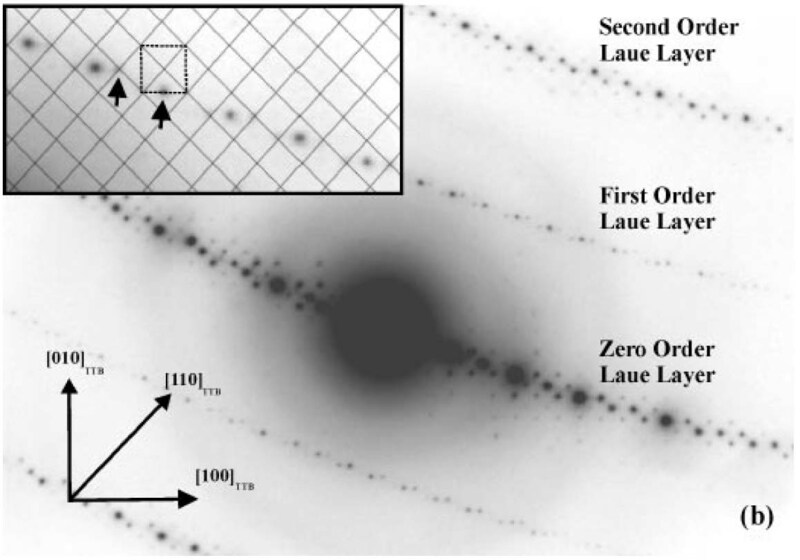 The electron diffraction pattern in Figure 3902c shows both ZOLZ and FOLZ reflections obtained from Zr41Ti14Cu12.5Ni10Be22.5 in  zone axis. Due to the absence of ZOLZ/FOLZ periodicity difference, we can know that there is no glide plane perpendicular to the  direction. G -- The radius of the FOLZ ring. H -- The distance between the plane of reciprocal lattice. λ -- The electron wavelength. In this case, c denotes the lattice parameter c.
Note that in reality the FOLZ ring depends on both dynamic and kinematic scattering in the TEM specimen. Sarah K. Haydon and David A. Jefferson, Quaternary Lead-Niobium-Tungsten Oxides Based on the Tetragonal Tungsten Bronze Structure, Journal of Solid State Chemistry 161, 135 - 151 (2001). S. K. Haydon, Ph.D. Thesis, University of Cambridge, 2000.